You can't pin all the blame on The Lion King for Disney's early 2000s nadir, but it's certainly part of a string of massive successes that established a musical-based template that robbed the animation studio of its creativity and opened the door for Pixar to eat Disney's lunch. As is the case in this tale of Simba the lion's journey from childhood to king, Disney's annual animated films became marked by big musical numbers and kid-friendly content and audiences began to pull away toward studios that catered to wider audiences, like the aforementioned Pixar and Dreamworks. Again, The Lion King isn't at fault for this, but it certainly helped cement a house style that quickly fell out of favor. 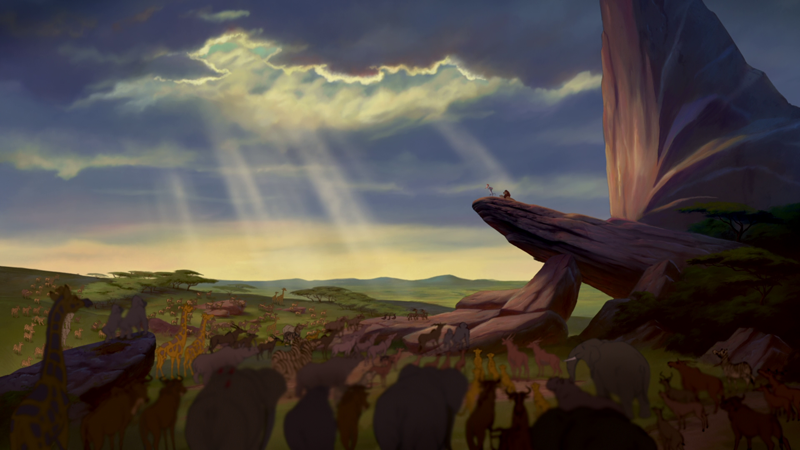 In a rather epic opening number, set to the now-classic "Circle of Life", all the animals of the African plains gather to meet and pay respect to the newborn prince cub Simba, son of Mufasa the lion, the undisputed leader of all he surveys. His position is undisputed by all except his brother Scar, a schemer who views Simba as an obstacle to his rightful ascension to the throne, one he will gladly push out of the way. His plan comes to fruition when, with the help of his henchmen hyenas, he puts young Simba in the path of a stampede, which Mufasa falls victim to in trying to save his son (joining a long lineage of dead Disney parents.) 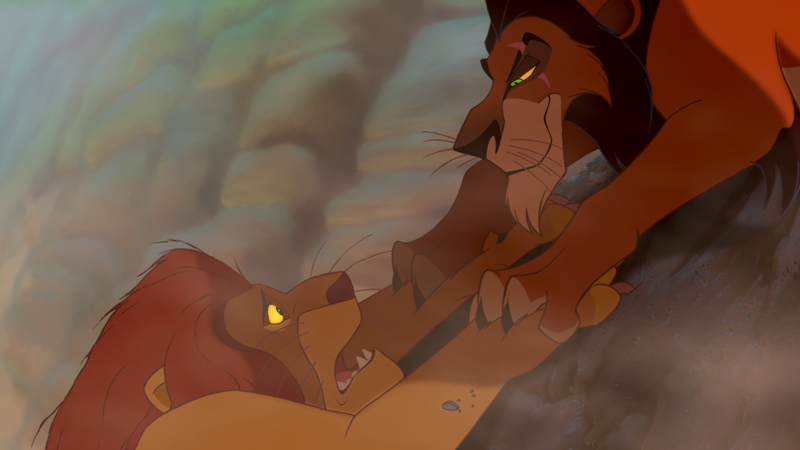 It's a classic kill-two-birds-with-one-stone scenario for Scar, as Mufasa is eliminated and Simba runs away, guilt-ridden because Scar convinces him he is at fault. For a film concerned with such heavy subject matter as regicide and childhood trauma, The Lion King is a pretty light-hearted affair through the bulk of the second act, as Simba meets his new pals Timon and Pumba, a pair of outcast jungle creatures with a chill philosophy on life, and reconnects with his childhood friend Nala, who quickly becomes a love interest to the now grown-up Simba. Post of what lightens the mood in this part of the film is certainly the songs--the earworm mantra "Hakuna Matata" and the Elton John/Tim Rice hit "Can You Feel the Love Tonight"--but either way the action would have stood in contrast to the dark establishing scenes early on and the climax to come. Checking in at a slim 89 minutes, The Lion King doesn't have a lot of padding to it, and it moves quickly, paced by a handful of songs, which are quite enjoyable, though the Broadway-style Be Prepared doesn't stack up well next to crowd-pleasers like the joyful I Just Can't Wait to Be King, a showcase for Jason Weaver's great vocals. There's enough animation style and adjusting gags in most scenes that it's only when everything is said and done that you come to realize that there wasn't a whole lot to the plot, with music and emotion filling in the gaps. As noted, it easy to forget that the plotting is sleight because the hand-drawn animation is so good, a reminder that it wasn't the artists that let computers take over the field. There are a number of truly captivating sequences in The Lion King, some aided by CG, while the characters are remarkably emotive, an important factor when dealing with animals, who, for the most part, don't have hands to gesture with. The gorgeous African vistas and detailed backgrounds have no shortcomings that computers could tackle either. 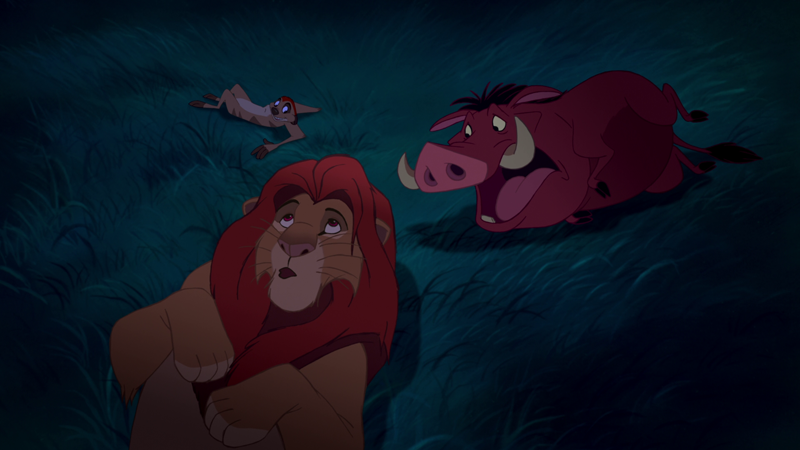 Of course, the voice you'll remember most is Nathan Lane, who, paired with Ernie Sabella as the film's comedic relief Timon and Pumba, is a hilarious scene-stealer and something of a Jiminy Cricket, guiding Simba in his growth. Unfortunately, that portion of his life is given short shrift, which is why the second act floats by, when it could have spent more time challenging Simba and exploring his maturation. Without it, the finale feels somewhat unearned, even if it's definitely satisfying. It's symptomatic of the film's overall hollowness, as there's just not enough "there" there. This new Signature Collection version of the film arrives in a two-disc set (one Blu-ray and one DVD) in a standard-width, dual-hubbed BR keepcase inside a quite attractive embossed, holofoil-enhanced slipcover. The Blu-ray features an animated menu, offering the option to watch the film, select chapters, adjust languages and check out the extras. Audio options include English DTS-HD Master Audio 7.1, French and Spanish Dolby Digital 5.1 tracks, while English SDH, French and Spanish subtitles are available. This presentation is the same as the one found on the previous Diamond Edition release, and until the film is remastered and released in 4K, there's no reason to expect it to look or sound any better. The 1080p, AVC-encoded 1.78:1 transfer on this disc is glorious, capturing all the beauty of the traditionally painted animation, with rich, perfectly saturated hues and a crisp, highly-detailed image that gets across all the detail in the film (and the virtually blemish-free master.) If the smoothness of the action doesn't get across the quality of this release, then obsessing over the artwork of the backgrounds certainly will, as the gorgeously illustrated rock formations are as eye-catching as anything in the film. The Lion King has a number of different looks from start to finish, including a clean, Don Bluth-style naturalness to the climactic final scenes, and they all get a proper reproduction here, with deep black levels and a freedom from digital distractions. If you have a copy of the DVD release, give it a watch before checking out this Blu-ray, so you can best appreciate how beautiful this release really looks. A good home-theater sound presentation has to start with one vital ingredient, and that's a good sound mix. The Lion King certainly has that, with a blend of Hans Zimmer's sweeping score, a selection of engaging songs, action-packed sequences, great animal sound effects and, of course, James Earl Jones' bass-laden voice. Building on that base, the DTS-HD Master Audio 7.1 utilizes the space of your theater to craft an enveloping experience, putting precise placement and seamless panning to tremendous use in order to place you directly in the middle of the scene, as it's power and discrete mixing (as well as an appropriately present low-end) all help add to the show, rather than act conspicuously as its own stand-alone element. If one needed to provide an example of the power of sight and sound to enhance storytelling, you could hardly do better than to pop in this Blu-ray. The Lion King has received a number of home-video releases over the years, including a previous Blu-ray Diamond Edition, so this new Signature Collection release is of questionable value, especially if you own the gorgeous 2011 Blu-ray. 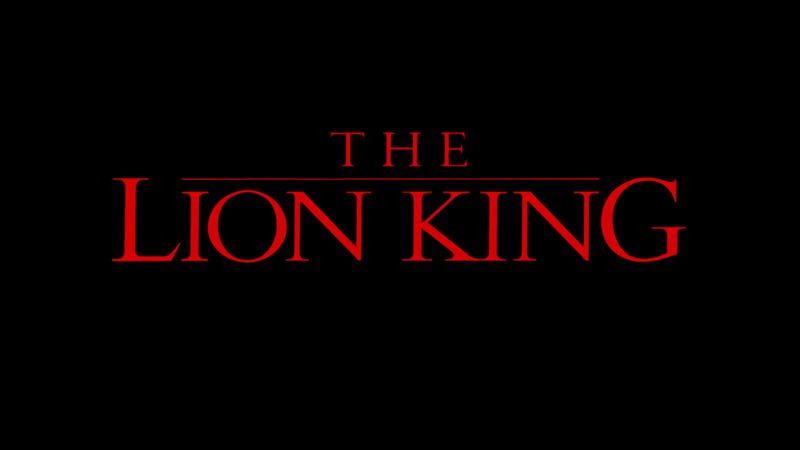 This newer version actually manages to offer less content than the earlier release, leaving out the second-screen experience, the 38-minute "Pride of The Lion King" featurette, the 20-minute "The Lion King: A Memoir - Don Hahn" and the interactive art gallery. And though the concept of the Virtual Vault (online extras from previous releases) has been carried over to the DisneyMoviesAnywhere service, not everything made the transition, with the 17-minute "Stage Journey" featurettes, 32-minute "Film Journey" featurettes, 12-minute "Story Journey" featurettes, four-minute "Storyboard to Film Comparison", two "Early Concepts," and an early, discarded Pumba scene all missing in action. What's new to this package starts with "The Recording Sessions" (4:46), which lets you check out the stars of the film in the booth, laying down the voices for the characters, which, if you're like me, is always a treat. Directors Roger Allers and Rob Minkoff provide an intro to the footage, which includes just about everyone in the film, including the great Rowan Atkinson and Whoopi Goldberg. The 2:53 "Visualizing a Villain" is an interesting oddity, as it features a group of dancers performing to Scar's "Be Prepared" as famed speed-painter David Garibaldi whips up a portrait of the evil lion. Garibaldi's paintings are always interesting to see come to fruition, but the dancing puts this a bit over the top. Following an intro by Allers and Minkoff, "Inside the Story Room" (23:42 over five parts) features pitch sessions from the development of the movie, with the directors acting out scenes as they present the storyboards, and try to get their vision of the film across to their collaborators, providing insight into the process of animation. Though the "Pride of The Lion King" documentary didn't make the leap to this Blu-ray, part of it did, as "Nathan and Matthew - The Extended Lion King Conversation" (7:08) includes more of the sit-down the The Producers pair conducted for that featurette. Producer Tom Schumacher acts as moderator, as the duo talks about auditioning for the film, the earliest incarnation of the movie and the influence of Ferris Bueller. Bits about a potentially obscene moment and John Wayne's dialogue are among the amusing stories shared, along with talk of the sometimes frustrating experience in the recording booth. The box art claims that the Sing-Along version of the film included here is all-new, but there was a karaoke version on the previous Blu-ray as well. Either way, this edition is extremely well-made, with specific, well-animated on-screen lyrics, which make it easy to understand the first few lines of "The Circle of Life". A song-selection menu is also included for jumping to your favorite tune. Beyond that, the set brings back a number of extras from the previous release, including a commentary by directors Allers and Minkoff, along with producer Don Hahn. The track has a wealth of info about the animation effort (explained in jargon-busting detail for newcomers) as well discussion of the story and production effort, including the ethnicities of the voice performers. Always lively and loaded with insight, it's a great listen for fans of animated movies. A 3:44 faux bloopers reel is amusing, as funny bits by the characters (not the voice actors) are presented, as if they are actually acting in the movie. It's an enjoyable premise that the cast and animators sell well. "The Morning Report" (2:40) a new song inserted from the Broadway show to the film for the previous Blu-ray returns as a stand-alone extra on this release, and it is what it is, not adding much to the affair, but not negatively affecting it either. A set of five deleted and alternate scenes (with Allers and Minkoff returning to introduce them) runs 12:42, and though nothing here really needed to be in the film, you do get a song from Mufasa (which is unexpected) and a scene that, in light of current politics, rings remarkably relevant. Also in the set is a code for a digital copy of the movie and a set of three film frames from the movie, in a cardstock display envelope. The Lion King is light on story, but there are enough memorable songs, excellent performances and terrific animation sequences that its shortcomings can easily forgiven, if not ignored. However, this edition, which is also somewhat light on previously-released extras, is hard to recommend, unless you missed out on the now-out-of-print Diamond Edition, but still want to enjoy the reference-quality transfer and audio (as good a reason as any to pick this one up.) Younger audiences will adore the fun stuff and fear the darker moments, while more knowledgeable viewers will lament the missed opportunities, but luxuriate in the hand-crafted animated splendor.